CONDITION REPORT: All original and excellent condition. 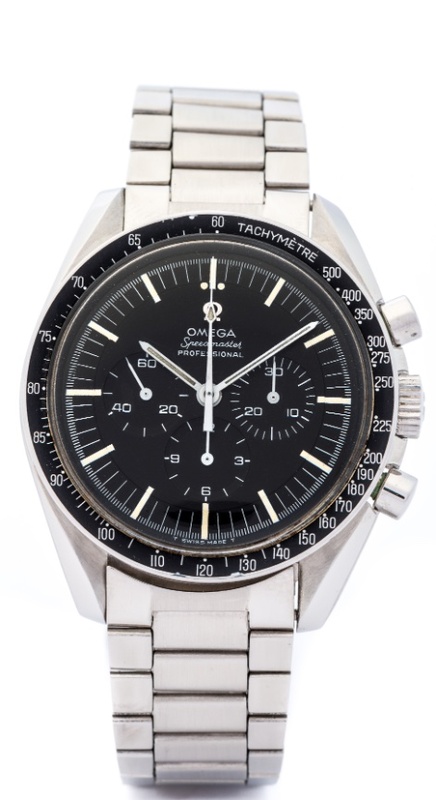 In 1968, Omega launched its Calibre 861 to replace the 321. The 861 was more precise, with its higher frequency, while more efficient to manufacture as it has a shuttle cam. Column wheel movements, like the 321, are expensive to produce and require very fine adjustment to function properly, so for mass-produced inexpensive movements a simpler solution is required. For example, the 861 contains a shuttle cam (or navette). The transitional models of 1968 with the new reference 145.022 instead of 145.012, kept the same dials as the 1967 professional models. They had the Omega metal applied logo.